Invincible Ransomware was created to remind users of the infamous WanaCry Ransomware; however, these two threats cannot be compared because the one we are discussing is not a real encryptor. According to our research team, this ransomware cannot encrypt files, and the ransom note it displays is completely bogus. The sample that was tested in our internal lab could not even lock the screen, which, of course, would make the infection more believable. That being said, it is possible that the threat will paralyze your screen to display the bogus ransom note. In either case, you need to remove Invincible Ransomware as soon as possible because this threat is a product of malicious cyber criminals, and you do not want to deal with them. If you continue reading this report, you will learn how the malicious ransomware is distributed, and you will learn how to delete it from your Windows operating system. Please take note of questions that might come up and then add them to the comments section so that we could review them. 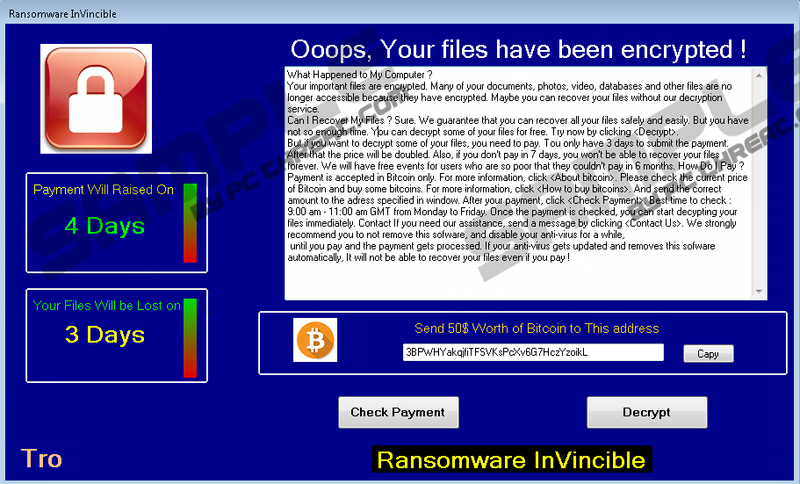 Although the ransom note window that Invincible Ransomware displays is not identical to the one used by WanaCry Ransomware, there are many similarities, and that is simply meant to make you think that you are dealing with a real threat. On the other hand, there are things on the “Ransomware InVincible” window that make no sense. For example, it is suggested that your files will be removed within 3 days, but it is also suggested that the sum of the ransom – which is $50 – will rise within 4 days. Why would anyone pay more after their files are lost? Also, the message does not represent the truth. If your screen was not locked, you should have no trouble checking your files and seeing that they are NOT encrypted. What if they are? In an unlikely event of finding your files encrypted, you do not want to follow the demands represented by the developer of Invincible Ransomware. Why? Well, if you pay $50 to 3BPWHYakqjfiTFSVKsPcXv6G7HczYzoikL, you will find yourself in the same mess, except that you will have 50 USD less in your pocket. According to research, it is possible for the malicious Invincible Ransomware to rewrite MBR, which is a feature linked to the well-known Petya Ransomware. In this case, you would have to repair the MBR using a Windows installation DVD. Hopefully, you do not need to deal with this, but if you do, please check the removal guide of Petya Ransomware to find the repair instructions. The version of Invincible Ransomware that we were analyzing could not lock the screen, and the window representing the ransom note could be closed easily. That is what we recommend doing because there is no point in paying attention to the demands and promises. After all, it is unlikely that you could get your files decrypted if you paid the ransom. If you want to take a gamble, do so at your own risk. Whatever happens, do not forget to delete Invincible Ransomware because the longer this threat is active on your PC, the longer you are at risk. Where is the launcher of Invincible Ransomware? If you have executed it yourself via a spam email or a bundled installer, you might be able to identify it. If you do, go ahead and remove it immediately. If you cannot get rid of the infection manually, you do not need to panic because a reliable and up-to-date anti-malware tool will quickly scan your operating system, identify the threats, and perform removal. As a matter of fact, we suggest installing this software even if you decide to delete Invincible Ransomware manually because it can ensure full-time protection that you obviously need. What if you skip this step and try to be more cautious about the installers you use, the emails you open, or the links you click on? Malware creators and distributors are smart, and, unfortunately, they can outsmart you. If you do not want to take any security-related risks, we suggest establishing reliable full-time protection as soon as possible. Identify the launcher file with an unknown name. Right-click this launcher and choose Delete. Delete any other suspicious files that might have been downloaded onto your PC. Empty Recycle Bin to complete the removal. N.B. Be careful about deleting harmless files. Also, utilize a free malware scanner to help you figure out if you have eliminated every single malicious component. Quick & tested solution for Invincible Ransomware removal.